Update 06/07/13: Yet another release from the developer — actually two of them. Version 7.41 was released, shortly followed by version 7.42, available in both 32- and 64-bit builds. To download it, go to the developer’s website and click where it says “MikuMikuDance (DirectX9 Ver. 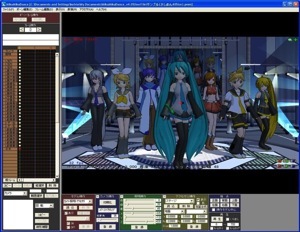 )” for the 32bit version, or “MikuMikuDance(x64 Ver)” for the 64bit version. A while ago we wrote about the apparent demise of MikuMikuDance, the free 3D animation software that Vocaloid fans created to allow people to make those really cool animations featuring the various Vocaloids that are popular on the Youtubes (as well as animations using characters from other franchises). At that time the developer had stated that he wasn’t planning on releasing any future versions of MMD. Well, he seems to have reversed that decision, because the developer, Higuchi U, just announced that a new release, version 7.39m, is now available for download. Improvements to program speed and response time. Improvements to stability, bug fixes. MMD now remembers your last open and save folder locations. IMPORTANT NOTE: according to the developer, there are one or more impostor versions of MMD floating around out there that contain viruses and various other malware. He recommends that you download only from his website directly. At the time we wrote about MMD’s apparent demise, we also wrote about a successor program called MikuMikuMoving, which some would argue as being more powerful, containing more features and with a better user interface. Anyway, the MikuMikuMoving folks have also recently put out a new version, Version 1.2.1.3, which you can download from the MikuMikuMoving website. Have you created anything cool with either of these tools? Let us know so we can link to it!